Extreme Hydroclimatic Events and Multivariate Hazards in a Changing Environment: A Remote Sensing Approach reviews multivariate hazards in a non-stationary environment, covering both short and long-term predictions from earth observations, along with long-term climate dynamics and models. 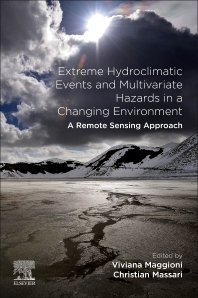 The book provides a detailed overview of remotely sensed observations, current and future satellite missions useful for hydrologic studies and water resources engineering, and a review of hydroclimatic hazards. Given these tools, readers can improve their abilities to monitor, model and predict these extremes with remote sensing. In addition, the book covers multivariate hazards, like landslides, in case studies that analyze the combination of natural hazards and their impact on the natural and built environment. Finally, it ties hydroclimatic hazards into the Sendai Framework, providing another set of tools for reducing disaster impacts. Dr Maggioni, is Assistant Professor of Environmental and Water Resources Engineering at George Mason University. At George Mason University she leads an active and interdisciplinary team of graduate and undergraduate students, investigating a wide variety of topics including monitoring and modeling storm water quantity and quality at the Mason main campus with state-of-the-art sensor networks, as well as combining water resources engineering with hydrometeorology and remote sensing using satellite data to evaluate conditions in regions, where direct observation is impossible, but the environmental consequences can be devastating. Christian Massari, PhD, is permanent researcher at the Research Institute for the Geo-Hydrological Protection (IRPI) of the National Research Council (CNR) of Italy. Thanks to a graduate research fellowship, he spent a year in the Department of Hydrology and Water Resources at the University of Arizona, Tucson, AZ in 2011. After returning to Italy, he was a postdoctoral research fellow in the hydrology and remote sensing group at IRPI, where he is a permanent researcher since January 2017. His research interests include data fusion and data assimilation of hydrological variables (e.g., soil moisture and rainfall), hydro-validation of satellite soil moisture and rainfall observations, filtering of satellite soil moisture, flooding risk analysis, and flood frequency assessment.